Do you have a gift for retail? Do you love buying and selling unique merchandise, designing and arranging compelling ways to display beautiful items, and caring for people? Are you interested in a way to do all that AND impact the world for eternity? 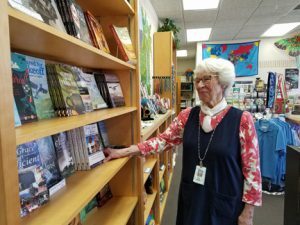 If so, we’re looking for a special person to manage the gift shop here at JAARS – where our primary mission is to help make Bible translation and language development possible, especially in the most remote and difficult places on earth. Responsible for managing the Townsend Gift Shop at JAARS, an initiative designed to provide guests with reminders of their visit and the mission of JAARS; to provide staff with unique and affordable gifts for friends, family, and supporters; and to provide funding for JAARS core mission operations in Waxhaw, NC. Supervise and train volunteer staff in operations and customer service. This is a 20 hour a week position with some additional hours required at times.